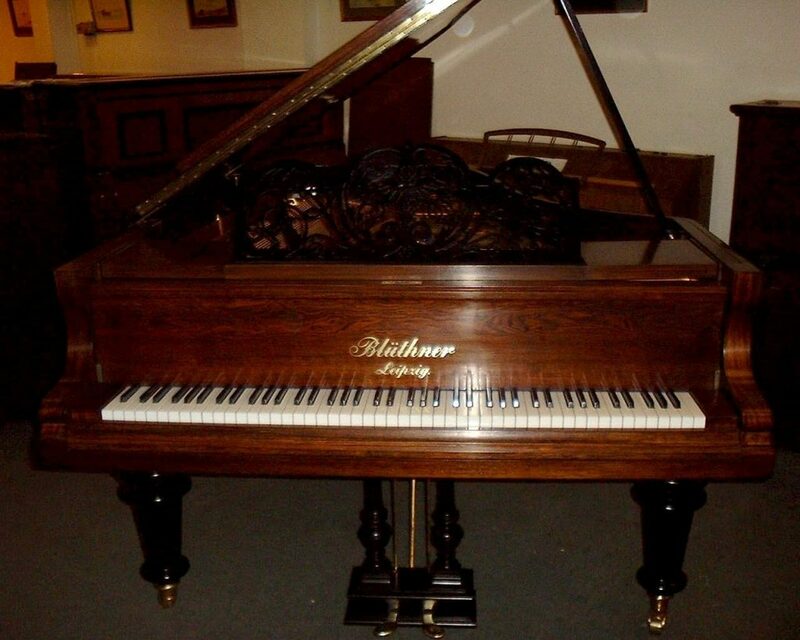 Visit our Piano Restoration page for all Blüthner restoration enquiries and our Piano Sales page for all Blüthner Piano sales enquiries or call 01865 790400. Julius Blüthner was born in Falkenhain, Germany in 1824. Like many piano-makers he started his career as a cabinet-maker. In 1853, after training as an apprentice with Holling & Spangenburg in Zeitz, he set up on his own to build grand pianos. After successfully exhibiting his pianos at the Industrial Exhibition in 1854, Julius had his pianos accepted by the Leipzig Conservatory of Music. Such was the quality of his instruments that demand increased from all over the world. Growth continued and by 1864 there were 137 workers on the payroll. He developed the `Aliquot’ system of stringing which involved a (non-struck) fourth string to notes in the treble sections. The idea was to create a sympathetic vibrating string that would enhance the tone. In our view the Aliquot system was a novel idea, but did not noticeably add to the already fine tone of their trichord-strung instruments. Most of his earlier grands were built with the well-known and unique “Blüthner patent” action. 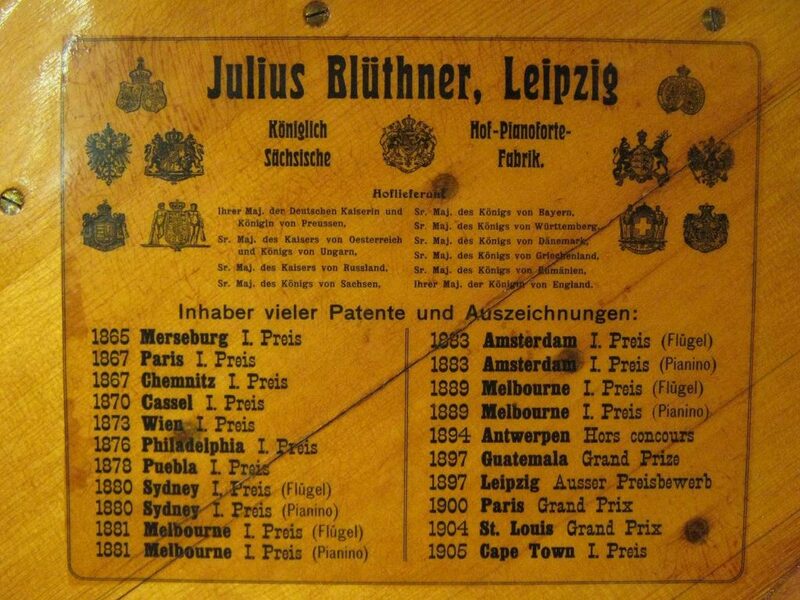 Demand continued to grow for Blüthner’s grands and by 1900 he became the second largest manufacturer in Europe, building uprights as well. His over damper actions were regarded as being the finest of all time. By 1914 the `patent’ action was regarded as less desirable than the more modern roller actions, and by 1919 Blüthner stopped making grands with the `patent’ action altogether. In 1910 Julius died, and his sons Max, Robert & Bruno took over the running of the business, though demand was by then in decline. During WWII the factory was completely destroyed, but the company was encouraged by the East German government to resume production, and for a time shared many of its facilities with C Bechstein before opening new factories back in Leipzig, from where Blüthner produce fine instruments today. From the 1890’s, Blüthner produced 7 sizes of grand, the smallest being around 5ft 9in up to 9ft – the concert size. Instead of calling them ‘models’, Blüthner grands were always referred to as `style’. Styles `5′ & `6′ were both 5ft 9in long – the `6′ was identical to the `5′, but had `Aliquot’ stringing. (See below). 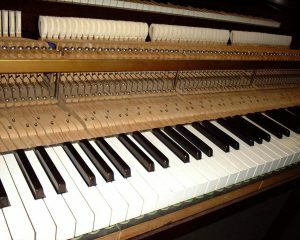 Most instruments made until 1914 had the familiar Blüthner patent action, though a few were built with roller actions. After this period, the patent action was discontinued in all models. From 1926 to the 1940’s, some models were added or changed. Style `12′ replaced the `7′ & `8′ (same length). Style `4a’ was introduced – 5ft 5in long. From the 1940’s onwards, Blüthner reversed its style numbers so that the Style 1 became the 9ft concert grand, and the style 11 became the 4ft 11in baby grand. Blüthner produced 4 types of upright, the straight-strung, overdamper; the overstrung, overdamper; the straight-strung underdamper & the overstrung overdamper. There would not appear to be any cut-off date when the overdamper gave way to the underdamper, but in general terms the underdamper action was introduced after the turn of the century, and the overdamper action was gradually phased out until WW1, after which only overstrung, underdamper uprights were made. 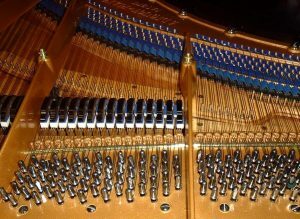 COURTNEY PIANOS wishes to make it clear that all information herein has been compiled at its own discretion, and opinions expressed are those of our researchers, based on our years of experience within the piano trade.